Valentine’s Day is less than a month away! Get into the sweetheart spirit with a beautiful banner flag from the United States Flag Store. All banner flags from the United States Flag Store are printed on durable polyester so they’re suitable for indoor or outdoor use. They’re printed, appliqued and embroidered with vibrant colors and are available at absolutely unbeatable prices. Check out a few of the great designs. 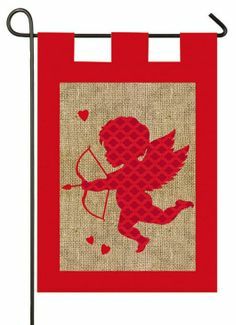 The Cupid and Heart Banner Flag is a great way to decorate your home for Valentine’s Day. The flag features a white silhouette of Cupid with his bow and arrow in the center of the flag. Behind cupid is a large pink heart on a red background with several white hearts around it. This flag measures 28 inches by 44 inches, includes a pole hem with attachment tabs, and is available from the United States Flag Store’s website for just $16.49. The Valentine Blossom Banner Flag is the perfect way to decorate for Valentine’s Day and bring a little spring feeling to your home, as well. The flag features a pink heart-shaped flower complete with pedals, a pink stem and pink leaves in front of a white background. Order this beautifully festive flag today for just $19.95. The Love Hearts Banner Flag is a beautiful flag for Valentine’s Day. The flag features a large red heart with the word “LOVE” printed across it in the center. Other pink, white and blue hearts surround it in front of a red and white background to make for a perfectly festive banner flag. This flag is appliqued and embroidered for added texture and quality. The flag measures 28 inches by 44 inches, includes a pole hem and attachment tabs, and is available on the United States Flag Store’s website for just $18.95. Valentine’s Day is just around the corner, and there’s no better way to get your house in the spirit for the holiday than with a banner flag from the United States Flag Store. All banner flags from the United States Flag Store are made from high-quality polyester and printed, appliqued, and embroidered with bright, vibrant colors. They’re suitable for indoor or outdoor display and are available at the best prices on the Internet. Check out a few of the whimsical designs. The Happy Valentine’s Day Banner Flag is the perfect way to decorate your home for Valentine’s Day. This flag features two whimsical hearts with smiling faces and white mitten hands. A Valentine’s envelope, rose and the text “Happy Valentine’s Day” also appear on the flag. This beautiful banner measures 28 inches by 44 inches, includes a pole hem and attachment tabs, and is available at the United States Flag Store for just $18.95. The Love Valentine’s Banner Flag is another great flag for Valentine’s Day. This flag is full of red, pink, hearts and love. The flag features a red heart in the center with the word “Love” printed below it. Pink and red hearts and flowers appear in background. This flag measures 28 inches by 40 inches, includes a pole hem and attachment tabs, and is available at the United States Flag Store for just $19.99. 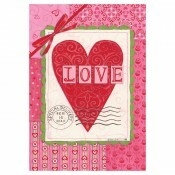 The Valentine’s Day L-O-V-E Banner Flag is simply an adorable way to bring festivity to Valentine’s Day. This flag features the word “LOVE” in big block letters adorned with X’s and O’s, hearts, and flowers. Butterflies and flowers appear in front of the light pink background. This flag is perfect for your home and is available from the United States Flag Store for just $19.99.